Last update issued on April 18, 2003 at 01:45 UTC. The geomagnetic field was unsettled to minor storm on April 17. Solar wind speed ranged between 608 and 768 km/sec under the influence of a high speed stream from coronal hole CH32. Wind speed slowly decreased during the latter half of the day. Solar flux measured at 20h UTC on 2.8 GHz was 101.5. The planetary A index was 30 (STAR Ap - based on the mean of three hour interval ap indices: 30.9). Three hour interval K indices: 35554533 (planetary), 35544432 (Boulder). At midnight there were 3 spotted regions on the visible disk. Solar flare activity was low. Only 1 C class event was recorded during the day. Region 10334 developed a trailing spot and was otherwise quiet and stable. Region 10335 developed slowly adding several small spots. New region 10336 rotated into view at the northeast limb. An active region behind the southeast limb should soon rotate into view. Flare: C4.4 at 22:16 UTC. 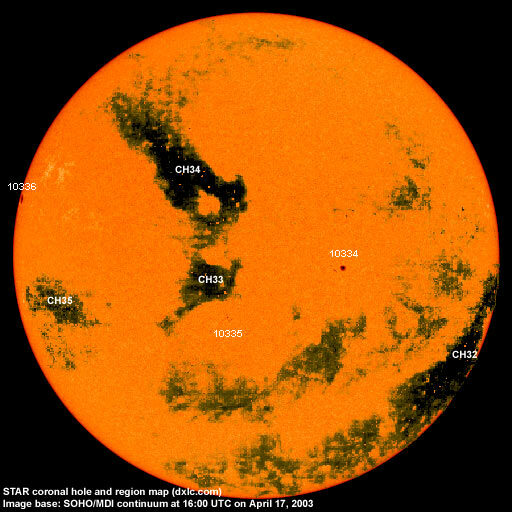 April 15-17: No obviously geoeffective CMEs observed. 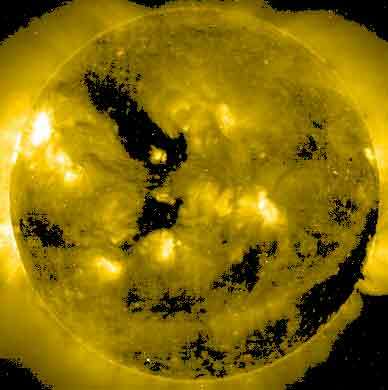 A large trans equatorial southern hemisphere coronal hole (CH32) was in a geoeffective position on April 11-13. 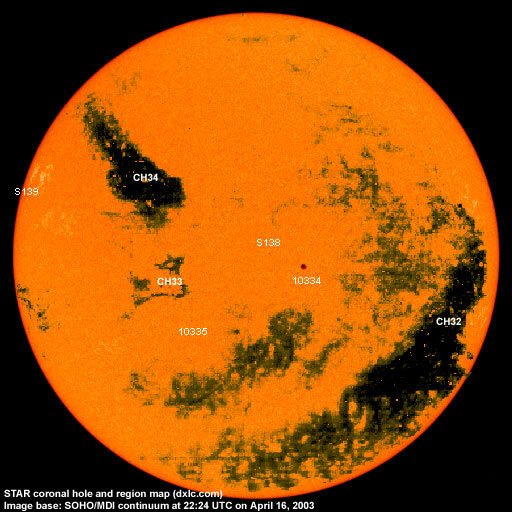 A small coronal hole (CH33) in the southern hemisphere will likely rotate into a geoeffective position on April 18. A recurrent coronal hole (CH34) in the northern hemisphere will rotate into a geoeffective position on April 18-19. A recurrent coronal hole (CH35) in the southern hemisphere is likely to be in a geoeffective position on April 21-22. Processed SOHO EIT 284 image at 19:06 UTC on April 17. Any black areas on the solar disk are likely coronal holes.